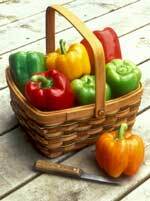 Colorful, crisp, nutritious and delicious, peppers are one of the most popular vegetables among home gardeners. Both sweet and hot peppers have been eaten by humans since around 5000 B.C., and these adaptable, versatile South American natives have since spread across the world, becoming integral parts of many cuisines, including Mexican, Central European, Asian, African, Spanish, and American southern and southwestern cooking. Planting – Select a garden site that gets full sun. Even if you’re not quite ready to plant peppers out, now is a good time to prepare the site by loosening the soil 8-10 inches deep, breaking up clods, and working in some aged compost or other organic matter as well as some complete organic fertilizer. Depending on the variety, plan to space peppers 18-24 inches apart in rows 24-36 inches apart. When you’re ready to transplant, dig a hole 3-4 inches deep where each pepper will go, fill the holes with water, and let it soak in. Then carefully remove the pepper start from its pot, carefully separate the roots, place it in the hole, and gently pack soil back in around the root ball. Leave a shallow bowl-shaped depression around each start to catch water and direct it to the roots. Water well immediately after planting. Growing Tips – Try to keep the soil consistently moist throughout the growing season, watering slowly and deeply so the plants can develop strong root systems. As fruits start to develop, you can sidedress the plants with organic fertilizer high in phosphorus and potassium – don’t give them too much nitrogen or they will put out a lot of leafy growth but fewer fruits. Harvesting – Peppers can be eaten at any time, but some varieties are designed to have good “green” flavor while others are best let to fully mature to a fruity, sweet red, yellow, or orange. Keep the green varieties well-picked to encourage additional fruit set. Growing your own peppers opens up a world of flavors, colors, shapes and textures that goes way beyond the typical green bell pepper and jalapeno hot pepper. Below is a sampler of the many varieties we’re growing this year: heirlooms and hybrids; big blocky bells and long sweet Italian types; red, yellow, orange, green, purple, brown, and multi-colored fruits; varieties for fresh eating, salsas, cooking, roasting, and drying; mild peppers, hot peppers, and blazing hot peppers. If this tempting array doesn’t convince you to plant and harvest your own hot and sweet peppers, keep in mind that bell peppers are among the foods on which pesticide residues have been most frequently found. So try to find organic peppers at a good farmers market or grow your own in order to get the freshest, best-tasting, most healthful fruits this summer. ‘Carmen’ – An early-maturing variety with fruits that can be eaten green or red, this Italian-type pepper is perfect for short-season regions in the Pacific Northwest. Sturdy compact plants produce numerous 6 inch horn-shaped peppers with medium thick, sweet green flesh that gets even more flavorful as it matures to red. Excellent for fresh salads or cooked dishes. 75 days from transplant. ‘Cherry Pick’ – Another early pepper that is delicious green or red! Smooth, round, bright red fruits like oversize cherries appear abundantly over a long harvest season on vigorous plants. The thick meaty mini-peppers can be used green or red for pickling, canning, salads, or snacking. 68 days from transplant. ‘Golden Star’ – Shiny mid-green 4 inch fruits mature to gorgeous, sunshine yellow bell peppers. Crisp, sweet peppers with very thick walls are outstanding for fresh snacking, stirfrying, or cooking. Heavy yields. 60-65 days from transplant. ‘Socrates’ – One of the earliest and best yielding bell peppers, with large, four-lobed fruits that are wonderful for eating fresh, cooking, or stuffing. Thick-walled, 4-5 inch peppers turn from green to red with delicious sweet flavor at all stages. 68 days from transplant. ‘Super Heavyweight’ – Jumbo bell peppers ripen from jade green to bright gold, with sweet thick flesh high in vitamin C. These blocky 5-6 inch fruits can weigh up to half a pound each! Ideal for stuffing, grilling, or eating fresh, with good flavor at all stages . 75-80 days from transplant. ‘Valencia’ – Brilliant pumpkin-orange bell peppers are juicy and sweet. Widely adapted plants produce good yields of the thick-walled, 4 inch fruits that add sweet fruity flavor and glowing color to salads, vegetable trays, or stir fries. 70-75 days from transplant. ‘Greek Golden Pepperoncini’ – These sweet, crunchy peppers with mild heat are a favorite for pickling, salads, & salsas, and luckily for Northwest gardeners, the 30 inch plants are productive even in cooler, short-season areas. Harvest the light yellow fruits at 2-3 inches long. 60-70 days from transplant. ‘Pasilla Bajio’ – It’s often classified as a hot pepper, but the slender, black-green, 8-10 inch fruits have a sweet berry flavor with very little heat. Plants produce abundant thin-walled peppers ideal for Mexican mole sauces. 78 days from transplant. ‘Holy Molé’ – Another Pasilla-type pepper, with mildly hot, nutty, tangy flavor. Heavy-yielding, 36 inch tall plants grow armloads of 9 inch long peppers that turn from glossy dark green to chocolate brown when mature. 78 days from transplant. ‘Mariachi’ – Large, conical, thick-fleshed chiles ripen from creamy yellow to bright red, with deliciously fruity, mildly hot flavor at any stage. Very early, dependable, & continuous yields for grilling, pickling, or salads. 65-70 days from transplant. ‘Serrano del Sol’ – Robust 30 inch plants produce excellent yields of medium hot, 3 by 1½ inch dark green fruits that resemble jalapenos. Hybrid variety offers larger, earlier fruits than open-pollinated serranos. Peppers ripen to red late in the season – use them fresh at any stage. 60-70 days from transplant. ‘Tam Jalapeno’ – For those who like jalapeno flavor but not so much heat, here’s a milder version of the jalapeno. Semi-compact 2 foot plants start producing early, with good yields of smooth, cylindrical, dark green peppers that are just right for pickling. Matures to red. 65-70 days from transplant. ‘Corno di Toro Red’ and ‘Corno di Toro Yellow’ – Italian-type horn-shaped peppers grow up to 10 inches long, with very sweet light green flesh that ripens to brilliant red and yellow, respectively. A superb variety for stuffing, fresh eating, grilling, or frying. The tall vigorous plants produce terrific harvests and may need staking to help hold up all their peppers. 70-80 days from transplant. ‘Orange Bell’ – One of the best-tasting peppers available, with excellent fresh eating qualities! Prolific plants give heavy yields of the brilliant orange, 3 by 4 inch fruits, with extremely thick, crunchy flesh and outstanding sweet flavor. 60 days from transplant for green, 90 for orange. ‘Sheepnose Pimiento’ – An Ohio heirloom with very flavorful, meaty, 3 by 4 inch cheese-shaped fruits that ripen to candy-apple red. The thick juicy flesh is especially good for canning, but these peppers are also excellent eaten fresh and they keep well in the refrigerator. 70-80 days from transplant. ‘Sweet Cheese Red’ and ‘Sweet Cheese Yellow’ – Juicy, thick-walled 2 inch rounded fruits ripen to bright cherry red and golden yellow. Sweeter and more succulent than traditional bell peppers, pimientos are excellent for salads, pickling, garnishes, and freezing. 70-80 days from transplant. ‘Big Jim’ Anaheim’ – Medium-hot, 10-12 inch tapered fruits are among the largest of the chile peppers – perfect for Chiles Rellenos. Each plant produces 24-30 pods which tend to ripen all at the same time from green to red. 75-80 days from transplant. ‘Black Hungarian’ – An eyecatching ornamental variety, with purple-veined foliage and intense purple flowers followed by masses of small, shiny black conical fruits that ripen to red. Fruits have good flavor and mild heat when black, turning hotter as they mature. 70-80 days from transplant. ‘Bulgarian Carrot’ – Crunchy, carrot-shaped 3-5 inch peppers ripen from green to gleaming golden orange on extremely productive compact plants. The super-hot fruits are terrific roasted, or in chutneys and salsas. 70-80 days from transplant. ‘Fish’ – Beautiful variegated plants produce unusual three-inch peppers that emerge creamy white with green stripes, turning orange with brown stripes, then bright red when fully mature. Originally from Philadelphia, this African-American heirloom is traditionally used in oyster houses around Chesapeake Bay. Fruits are extremely hot, perfect for salsa, too! 80 days from transplant. ‘Lemon Drop’ – A Peruvian variety that’s gaining popularity wider popularity due to its exceptional fruity flavor. Plants yield dozens of bright yellow, 2-3 inch long, crinkled fruits that are intensely hot with a touch of citrus. Use fresh or smoked to add a flavorful twist to salsas. 90-100 days from transplant. ‘Long Red Cayenne’ – Narrow, 6 to 10 inch long fruits with pungent spicy flavor turn a deep glossy red when fully ripe. In the fall, when fruits have matured, you can hang them in a colorful bunch to dry – then crush or grind them for cayenne and crushed red peppers! 80-90 days from transplant. ‘Black Pearl’ – A highly decorative, compact variety that’s ideal for container gardening. Mix the black-foliaged, 18 inch plants with other ornamentals or use them to spice up the vegetable garden. Bright white flowers are followed by loads of glossy black ornamental peppers that are held upright on the stems and turn bright red when mature. 90 days from transplant. For our full list of pepper varieties and descriptions, see our Classic Vegetable List and Heirloom Vegetable List.